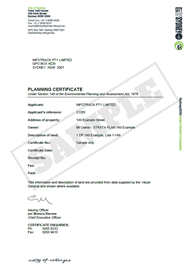 Section 149 Certificate, also known as zoning certificates, are legal documents issued by NSW Council's under the provisions of the Environmental Planning and Assessment Act 1979. They contain information about how a property may be used and restrictions on development that may apply. A section 149 (2) and section 149 (5) planning certificate can be ordered separately or as a combined certificate. For conveyancing purposes a section 149 (2) is required as a minimum. Moving forward, councils will transition from issuing 149s, to instead issuing 10.7s. This commenced on 1 March 2018 with most of the changes coming into effect from this date. Others will take longer to come into effect as they require further guidance and consultation. Click here for more information. A section 149 (2) Certificate is limited to containing only that information about complying development as set out in clause 3 of Schedule 4 of the EP&A Regulations. This certificate provides information such as the zoning of the land, permissible and prohibited land uses, details of exempt and complying development, controls for development or hazards. These include matters such as heritage, coastal protection, bush fire, contaminated land and flooding. These matters are identified in Schedule 4 of the Environmental Planning and Assessment Regulation 2000. A section 149 (5) Certificate provides both the information available in a Section 149 (2) and additional matters such as dwelling permissiblity, burials on private land and information on applicability of the Council’s Management of Contaminated Land Policy if applicable. Note: if required a simple Section 149 (2) certificate can be issued which only includes exempt and complying development provisions. This certificate is not to be relied upon for the purpose of an Annexure to a Contract for the Sale of Land under the Conveyancing Act 1919.